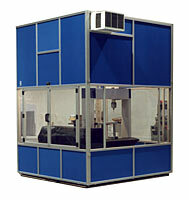 EAF Industrial Enclosures are engineered and pre-fabricated to meet your exacting needs. The use of advance technologies enables EAF to create a complete line of modular t-slotted aluminum enclosures, designed to be flexible, while allowing for work area growth within limited factory/plant floor space. EAF has access to a complete line of modular, extruded t-slotted aluminum profiles and components, that are used in every product we make. 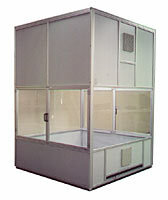 The modular panel design provides unique and affordable enclosure solutions for ease of assembly and installation, and are crated for cost effective shipping anywhere in the world.